Bling in the sun has come to Toronto courtesy of India. But this shopping trip will not be taking you to Gerrard Street East for a tour through the mountains of handbags stamped with Hindu gods or past the rows of sparkly polyester chiffon saris. After all, princesses need shopping options, too. 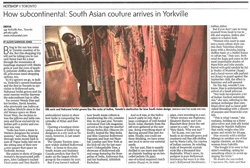 So it’s uptown we go, to Indiva, Yorkville’s newest boutique and the first in Toronto to specialize in Bollywood saris, Maharani bridal gowns and the most runway-worthy daywear the subcontinent has to offer. For owners Wendy Dias and her brother, David Anselm, who previously ran Indiva as an Indian lifestyle store in the old Versace space on Bloor Street West, the decision to toss the pillows and table runners and focus exclusively on Indian prêt-a-porter and couture was easy. “India has been a muse to Western designers for several seasons,” says Dias, flipping through some recent back issues of Vogue India laid out in the sitting area of their new 4,000-square-foot space on Yorkville Avenue. She points to shots of Giorgio Armani’s deconstructed jodhpurs, John Galliano’s ruched Churi pants and Tory Burch’s embroidered tunics to show how India is conquering the catwalks of Milan and New York. Opening a boutique showcasing a dozen of India’s top designers in a city such as Toronto, however, is just smart retailing. The Greater Toronto Area – now widely dubbed Bollywood West – is home to 600,000 South Asians and Statistics Canada predicts that they’ll make up the largest ethnic group in the country by 2017. But if you haven’t noticed how South Asian culture is transforming the city, consider this: In the past year, Toronto welcomed Desi Life magazine, served as the stage for another Deepa Mehta film (Heaven On Earth), hosted the Miss India and Miss Glamour Bollywood Pageants and beat out Mumbai, London and New York as the kick-off city for last summer’s Unforgettable Tour, a showcase of Bollywood silk and songs featuring the Brangelina of India, Aishwarya Rai, and her husband, Abhishek Bachchan. And so it was, at the Indiva launch party in July, that a large contingent of well-heeled South Asian clientele from the old store gathered at the new one, doing everything short of dancing around Dias and Anselm. Finally, you could see them thinking, we have someone local to serve our sartorial needs. For $1,299, you can turn heads in an emerald-green and cranberry-red fine silk-chiffon sari by Neeta Lulla, the czarina of Indian couture. Its winding trails of Swarovski crystals wink like a thousand tiny flashbulbs. What’s more, its pedigree is pure Bollywood: Aishwarya Rai wore it in this year’s Bollywood blockbuster, Jodhaa Akbar. But if you don’t care to wrap yourself from head to toe in silk and sequins, Indiva also caters to a fusion look. “Women who want to ease into a more ethnic style can mix their Valentino skinny jeans with a Monisha Jaising chiffon tunic or a Malini Ramani caftan top,” Dias says. Both retail for $499 and come in the most improbable shades of Maya blue and inky purple. Paired with gold sandals by Jolly Studio of Mumbai ($399) and a hand-woven silk pashmina ($299) to guard against the September chill, the effect is feminine and self-assured. On this day, wouldn’t you know, Dias is anticipating the arrival of a Saudi princess. “Her look incorporates a lot of Indian Zardozi embroideries,” she says, referring to the antique technique that combines silver and 24-karat gold coiled threading with a shower of sequins and Swarovski crystals. “This is what I mean,” she explains, holding up a three-piece silver and pink silk bridal lehenga by Manish Malhotra that easily weighs nine kilograms and retails for $8,999. Dias recently sold a similar lehenga to another one of her regular clientele, an Italian woman from Oakville.